Take the American Heart Association Challenge and change your sodium intake! The heart and stroke experts launched a three-week Sodium Swap Challenge. The group is calling upon Americans to identify and track the Salty Six — the foods in their diet loaded with extra salt that increase their risk for heart disease and stroke. The goal is for Americans to limit sodium intake to no more than 1,500 milligrams each day. Currently, the typical American consumes more than twice that. Never mind giving up the salt shaker, it will take more than that to lower your sodium intake. Americans can dramatically reduce their daily salt intake by cutting bread, cold cuts and cured meats from their diet, according to the American Heart Association/American Stroke Association. Limiting condiments and reading nutritional labels are other ways to kick a high-sodium habit, the experts noted in an association news release. 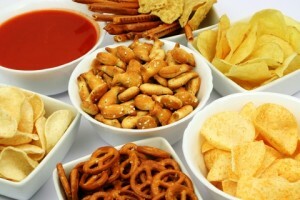 They also said people can change their palate and enjoy foods with less salt in just 21 days. During the first week of the challenge, Americans are asked to limit consumption of bread, rolls, cold cuts and cured meats. A slice of bread can contain more than 200 mg of sodium and one serving of turkey cold cuts as much as 1,050 mg. It’s also recommended that you check food labels and track sodium consumption daily. For the second week, Americans are asked to opt for lower-salt versions of pizza and poultry. The idea is to choose foods with less cheese or meat and more vegetables. Poultry should also be skinless and not processed or fried. Focus on soup and sandwiches during the third week, the associations said. Soups often contain up to 940 mg of sodium per serving. Layering meats, cheese and condiments to a sandwich can add more than 1,500 mg of sodium. After three weeks, the experts said challenge participants should notice a difference in how they feel after eating and how their food tastes with less sodium usage. The American Heart Association provides more information on the Sodium Swap Challenge. We are pleased to announce publishing “Can Santa Find Me on Christmas?”, which is our first enhanced e-book for young readers. It features animation, narration, and text highlighting to engage and assist emerging readers in developing independent reading skills. In our enhanced e-book, Santa goes digital, using modern day solutions for the age-old worry of children away from home on Christmas. 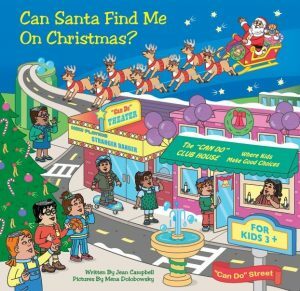 In “Can Santa Find Me on Christmas?” the “Can Do” Kids learn how Santa will deliver their gifts to them wherever they are. In the beginning of our enhanced e-book, the reader is offered the choice of reading the book independently or with the enhancements of animation, narration and text highlighting. Animation is used sparingly to prevent distracting a young reader from listening to the story and identifying each word as it is highlighted. Each of the 22 pages in the enhanced e-book features the “Can Do” characters in full color illustrations. Developed for the Apple platform,“Can Santa Find Me on Christmas?” is available on Apple’s iTunes. Our enhanced e-book is the first of new happenings on”Can Do” Street. There is more to come in 2017…stay tuned! OnGuardOnline.gov wants you to know that as a parent, you have control over the personal information companies collect online from your kids under 13. The Children’s Online Privacy Protection Act gives you tools to do that. The Federal Trade Commission, the nation’s consumer protection agency, enforces the COPPA Rule. If a site or service is covered by COPPA, it has to get your consent before collecting personal information from your child and it has to honor your choices about how that information is used. 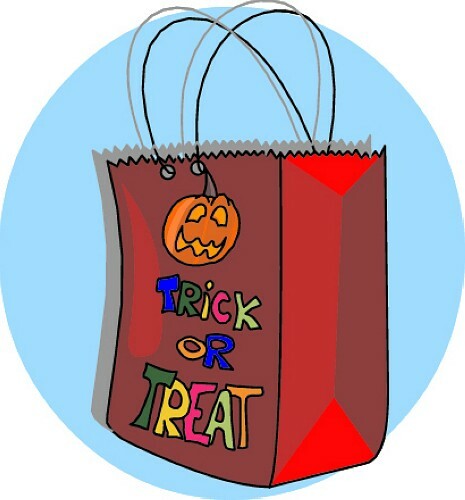 ‘Lucky 13’ Tips for a Safe Halloween is a pass along for the Food and Drug Administration, the Consumer Product Safety Commission and the Centers for Disease Control and Prevention. Wear costumes made of fire-retardant materials; look for “flame resistant” on the label. If you make your costume, use flame-resistant fabrics such as polyester or nylon to be safe. Wear bright, reflective costumes or add strips of reflective tape and be safe because you’ll be more visible; make sure the costumes aren’t so long that you’re in danger of tripping. Wear makeup and hats, to be safe, rather than masks that can obscure your vision. To be on the safe side, test the makeup you plan to use by putting a small amount on your arm a couple of days in advance. If a rash, redness, swelling, or other signs of irritation develop where the makeup was applied, that’s a sign of a possible allergy. Check FDA’s list of color additives to see if makeup additives are FDA approved and safe for use. If they aren’t approved for their intended use, don’t use it. It is not a safe to wear decorative contact lenses unless you have seen an eye care professional and gotten a proper lens fitting and instructions for using the lenses. Don’t let your kids eat candy until it has been inspected at home.